I am a man on a mission and that mission is to rid the United Kingdom of boring food at special events and corporate functions. I have been to so many of these events and it is more or less the same every time; tedious, uninteresting and bland food. I am amazed that people have (and continue) to put up with it. I am sure that here in Elland, the story has been just the same. Great events but lousy food…and a diverted taxi on the way home past the Indian? Yes, makes sense. But I think things are going to change and I am going to do my utmost to convince fourteen thousand people of Elland that there is an alternative to the tasteless tyranny and the answer is pig shaped. Yes, the days of boring event food are gone. Welcome to the hog roast age! Event catering is serious so it’s time to put some seriously good tastes back on the menu. and Taste the Cracklin is going to transform special events, large family functions and corporate meetings with some of the best, most delicious freshly cooked food you will ever experience in this part of Yorkshire. Now I can always sense a concern when I speak to people about the many benefits of going the hog roast route and that is cost. Yes, money is a big factor for many people when choosing event catering and quite right, too. Money is tight these days and every penny really does make a difference…so it makes even more sense to choose a hog roast caterer! Yes, I know hog roast looks very extravagant and it looks like you have blown your budget but hear me out. Hog roast makes sense if you want great quality food at a not so great price. How does it do this? Well hog roast is naturally an epic sized feast, because it is a whole pig! But you may still be surprised that hog roast is quite capable of being carved up and served into enough portions to feed over one hundred people. That is an incredible amount of food, and you can guarantee that everyone is going to eat every last bit, which means less waste. Just think how many sandwiches and sausage rolls would normally be thrown away. But that’s not all. Hog roast provides your guests with a bit of entertainment, too. No, it doesn’t do a stand up routine or do Sinatra covers on the karaoke but the mere fact that the hog roast chef is going to cooking this glorious looking beast in front of your guests is going to be entertaining in itself. People love to watch their meal being cooked at the best of times and top restaurants are famous for it, so this adds a touch of glamour to your event. It also reinforces the fact that your Elland friends are being treated to fresh cooking and not some warmed up sad substitute. Every aspect of an Elland hog roast is quite special, in fact you really are getting five star treatment in a way. 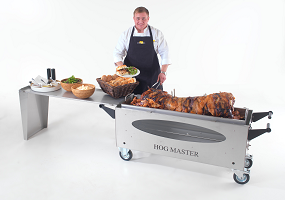 The dedicated hog roast chef will hand pick your pig from a reputable local supplier. They are very choosy and will only ever pick a pig that is just right. That means total quality and the very best tasting meat guaranteed. Good meat needs to be treated with some respect, of course, and when it comes to the cooking, that respect comes in the shape of a long slow roasting process. Slow roasting is essential when it comes to a big hearty piece of meat and they don’t come much bigger than a whole pig. This is why the hog roast chef will dedicate a whole six hours cooking time to your hog roast. You may think that sounds way over the top but you do have to remember that slow roasting really helps flavour the meat by soaking up all those essential juices from the bones. This really is a masterpiece of a meal, and it’s all going to be enjoyed by you and your guests.